Sticker Labelling Machines including Automatic StickerLabelingMachine, Rotary StickerLabelingMachine, Twin Head Rotary Wrap Round Sticker Labelling Machine,Vial Sticker Labelling Machine, Bottle Sticker Labelling Machine, Jar & Tin High Speed Sticker Labelling Machine, Single Side Flat Bottle StickerLabelingMachine, TWIN /Two Side (Front & Back) Flat Bottle Sticker Labelling Machine, Horizontal Top Side Sticker Labelling Machine, Carton & Pouch Sticker Labelling Machine, Two side (front and back) Top & side Sticker Labelling Machine, Rotary Wrap Round Sticker Labelling Machine,	Rotary Ampoule/Vial Sticker Labelling Machine, Vertical Rotary Ampoule/Vial Sticker Labelling Machine, Ampoule/Vial StickerLabelingMachine, Ampoule/Vial Sself adhesive Labelling Machines. Hologram Sticker Labelling Machine, Front, Back and Top Application Sticker Labelling Machine, Label Roll Winding and Counting Machine, Wet Glue & Sticker Labelling Combine Machine,Coding Systems Online Contact and Non-Contact Coding System and Customised Sticker Labelling Machine for any kind of bottle and shape, speed etc. Agents Required– USA, France, Poland, Bulgaria, Saudi Arabia, Ecuador, Peru, South Africa, Egypt, Indonesia, UAE, Vietnam, Pakistan, Uganda, Philippines, Greece, Columbia, Malaysia, Nigeria, Ethiopia, Lebanon, Kenya, Kuwait, Sri Lanka, Ghana, Nepal, Ukraine, Bangladesh, Australia, Switzerland, Sudan, Russia, Yemen, Iran, Morocco, Malawi, Thailand, Tanzania, Canada, Belarus, USA, Cyprus, UAE, Republic of Congo, Canada, Russia, South Africa, Croatia, Nepal,Oman, Ukraine, China, Bhutan, Ghana, Yugoslavia, Nigeria, Netherlands, Vietnam, Thailand, Kenya, Iran, Malaysia, Bangladesh, Pakistan, U.A.E,Saudi Arabia Monrovia, Philippines, Spain, Liberia, Iran, U.S.A, Canada, Germany, Italy, Jordan, Syria, Turkey, Kuwait, Iran, Algeria, Argentina, Bangladesh, Bangkok, Indonesia, Malaysia, Vietnam, Nigeria, Ghana, Malawi, Egypt, Ukraine, Nepal, Srilanka, Bangladesh, Tibet Lusaka, Egypt, England, UAE, Bahrain, Vietnam, Iran, Poland, Tanzania, Malaysia, Nigeria, Sudan, U.K., Italy, Thailand, Span, Kenya, Lebanon, Kingdom of Saudi Arabia, Sudan, Botswana, Iraq, Thailand, Span, Mauritius, Ethiopia, Congo, Zambia, Namibia, Mozambique, Uganda, Yemen, Somaliya. Net Weight approx. 400 kg.,approx. 400 to 500 kg. Corrugated box, Carton box printing and Labeling machine and bar code quality including box labeling machine print and apply for high bar code read rates. Print & Apply labeling systems are machines for the printing and application of pressure-sensitive labels. They may be interfaced with a computer and are able to apply labels to either still or moving products just after printing. Production Speed Per Hour 4800 to 6000 Products per Hour (Speed Depends up on the Size of the Product and Operator Skills). Carton Holding Unit Belt Type Spring Based Top Conveyor. Polycarbonate Enclosure in Stainless Steel Structure. 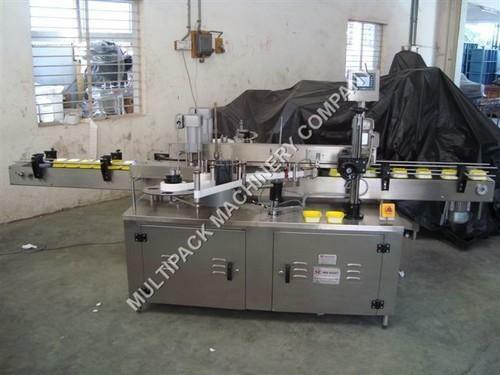 This model is used for precise labelling on single side or double , Three and four side labeling simultaneously on any shape & size of containers. The machine operates at the speed upto 100 - 200 containers/min. (depending upon the label length). Different shape and size of containers can be accommodated on the same machine with / without the help of change parts. Two label dispensers labelling machine operates independently which allows different size of label application on either side. The latest Digital Servo Technology offers most precise placement accuracy. Also, unique spring loaded twin worm system virtually eliminates the use of any tools making it 'tool-less' operation for the quickest changeover and less down time for variety of products. Due to spring action, it ensures high safety to containers in case of toppling down & does not damage it. Also, it can be designed to apply 3rd and 4th label (neck label) simultaneously on the product, if required. Bottle Orientation Unit For Multi Product Handling w/o Change Part for specail type bottle and shape. Require Filtered Compressed Air (6 Bar) to be provided by customer only. 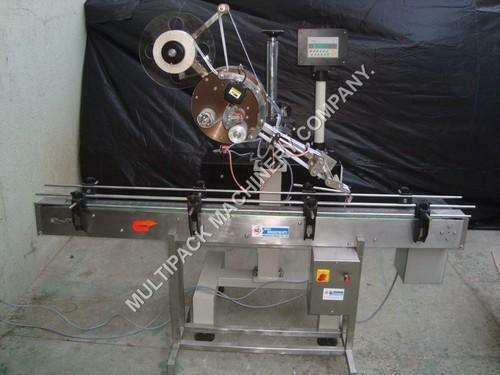 Our Sticker Labelling Machine is one of the most user friendly. The Machine incorporates latest sophisticated Micro Processor Control Label Dispensing system with user friendly Sensing system for Label and Product. 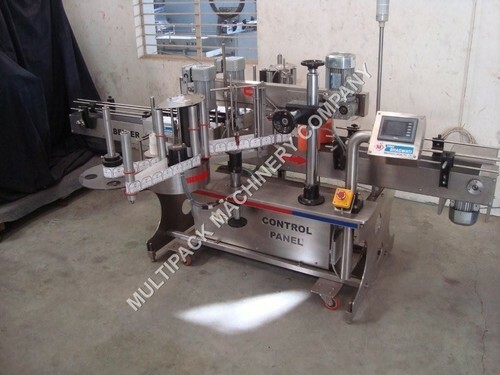 The Machine is suitable for Labelling on Round Bottle, Jars and other round objects. It is capable of Labelling up to 150 Products per minute depending on products diameter and label size. Production Speed Per Hour 3800 to 5000 Products per Hour (Speed Depends up on the Size of the Product and Operator Skills). 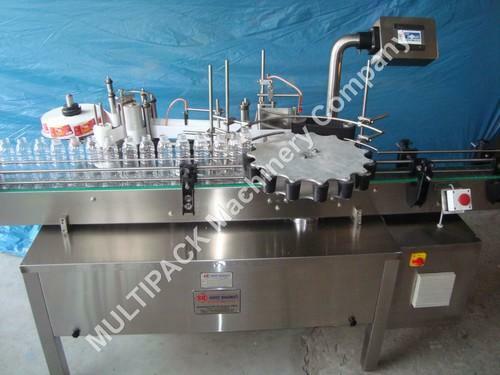 Our front and Back labeler – label applicator applying Front and Back Labels on Flat/Oval/Square/Round shape containers , Ampoules carton, Vials box and carton, Pet / Glass / HDPE Bottles and Jars double side labeler machine, special shaped front and back labeler machine for Container, Canisters, Cartons, Boxes, Caps packages etc. 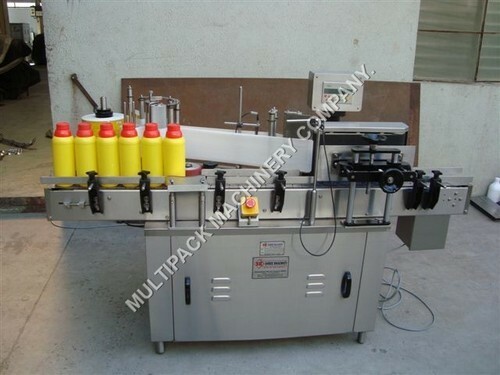 Our front and back labeling machines are also known as two side labeling systems, front and back labeling equipment, two side bottle labeling machines, back and front labeler, Bottle self adhesive front and back labeling machinery, self adhesive bottle labelling machinery, two side bottle labelling machine, Servo front back bottle labellers, Servo base front , back , top side labelling equipment. Our labeler machine with Built with high quality, versatility and durability from the back, top and bottom up. The Shree Bhagwati Self adhesive labeling system is engineered for ease of changeover of products and simplicity and user friendly of operation of operators. Shree Bhagwati labeler machines is high speed with high performance, economically-priced system for front/ back/ top / security seal / L shape / U Shape, wrap or customized applications as per requirement with production rates up to 300 ppm depend of bottle and labels sizes. Shree Bhagwati surpasses all labelers equipment in its price range and is suitable for multi-shift operations where long-term reliability is important. Features such as Servo + PLC control with color touch screen and simple ‘no tool/no change parts’ operation provide maximum flexibility for today’s packagers.Our label application system designed to accurately and efficiently apply Front, Front & Back, Multi-Panel and Full Wrap Labels to an expansive range of plastic, glass or paper containers Front and Back Labelling Machine. 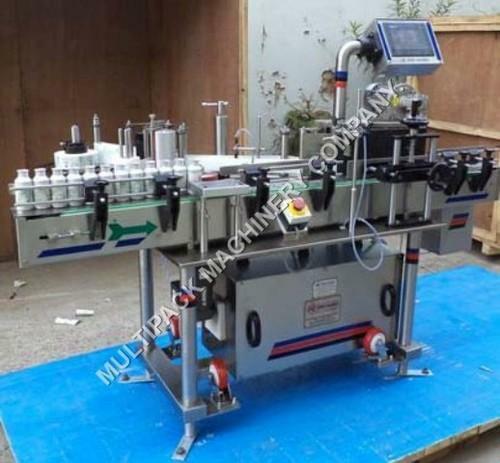 Also we have many different model in labelers machines ranges like Ampoules labeler, Vials labelers, Bottles Front and Back Labelling Machine, Jars Front and Back Labelling Machine, Container and Canisters , Cartons Front and Back Labelling Machine, Boxes Front and Back Labelling Machine, Front and Back labeler from Caps packages etc. 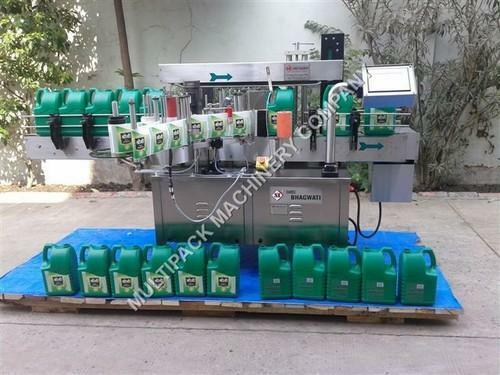 Front and Back Labelling Machine , Labelling machines are used in wide range of industries such as Pharmaceuticals, FMCG, Cosmetics, agro chemical , Chemical, Food, Beverage, Pesticides, Gifts, Agriculture, Electronics and many more. Some companies use Labelling machines that are small, handheld, and easily portable to apply labels on different products applying Front and Back Labels on Flat/Oval/Square/Round shape containers. 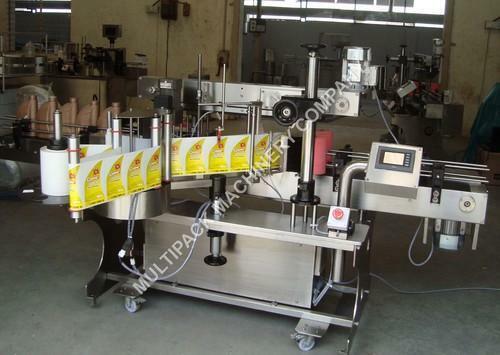 Our Sticker Labelling Machine is suitable for labelling on Round Vials and smaller size of Bottles. The Machine incorporates latest sophisticated Micro Processor Control Label Dispensing system with user friendly Sensing system for Label and Product. It is capable of Labelling up to 60units per minute depending on product diameter and label size. The Sticker Labelling Machine has its own unique single point synchronised speed control system. The Inbuilt Automated Label Length detection systems eliminates any need for manually feeding and storing of Label Length data in memory and retrieving the same every time for change of Label Size & re-starting the machine. The System thus saves valuable time, avoiding machine-down time, and helps achieve higher production. Fully Automatic, User Friendly, Sticker (Self-Adhesive) Labelling Machine Model SBSL-120F, Suitable to apply accurate Labels on Double Side (Front & Back) of Flat / Oval / Square shaped products having PET, Plastic, HDPE, LDPE, Glass or any other surface. The Machine incorporates latest sophisticated Microprocessor Controlled Stepper Motor Drive, Fiber Optic Label and Container sensing system. SBSL-120F Sticker Labelling machines are 100% User Friendly, Virtually Maintenance Free and does not require Data Inputs for Label Size. Output up to 150 labels per minute. Automatic label application presents significant time savings over manually printing and applying labels to products. The Automatic Label Applicator’s thermal transfer printer generates labels with clear, crisp, scanable barcodes as well as variable text, graphics and logos at print speeds of 12″/second. Barcode labels are applied at rates up to 300ppm (Blow on), minimizing packing station bottlenecks caused by manual label application. Cost effective and efficient in your production environment. Whether your label application requirements are: primary, secondary, top, bottom, corner wrap, or multi-panel variable product identification labeling, PSI can configure a label print applicator to enhance your packing station productivity. Examples of products labeled using Bhagwati’s automatic label applicator include: simple box, packaged garment, pallet, and health and beauty item, pharmaceutical or automotive part. 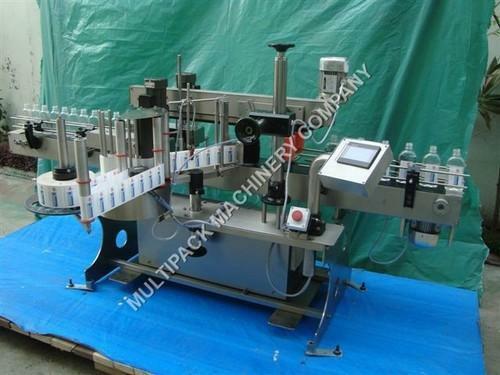 Fully Automatic Super High Speed Rotary, Sticker (Self – Adhesive) Labelling Machine, Model, Suitable to apply accurate Labels on Ampoules and Vials with maximum output upto 100 Labels Per Minute. 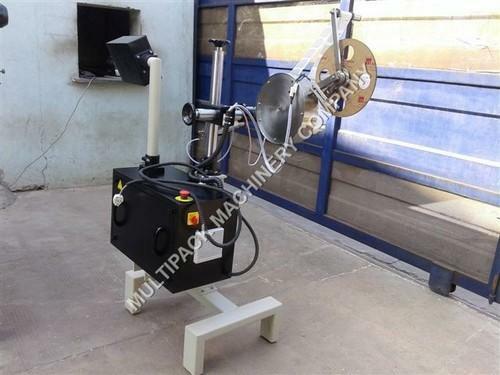 Rotary Machine specially designed to apply labels on Ampoules and Vials and other small diameter cylindrical products at higher speed with better accuracy. The Machine incorporates latest sophisticated microprocessor Controlled Stepper Motor Drive, Fiber Optic Label and Product sensing system. OBMA series Sticker Labeling machines are 100% User Friendly, Virtually Maintenance Free and do not require Data Inputs for Label Size. 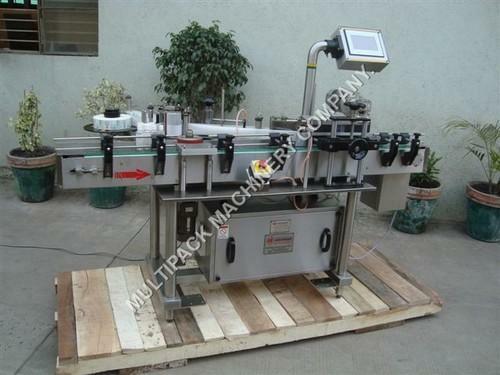 This horizontal top and bottom sticker labeling machine is an ultra modern and user friendly equipment. It has a micro processor controlled system for dispensing the labels; as well as the latest system for sensing labels and products. 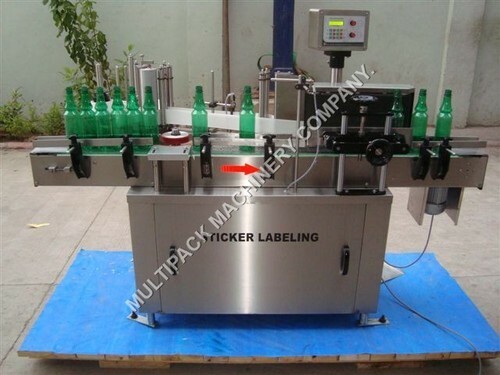 This top and bottom labeling machine model is highly suitable for applying labels on the top and bottom of various types of containers made from aluminum, glass, plastic, HDPE, LDPE, PP, etc. and also for labeling cartons, batteries, pouches, etc. of different shapes and sizes. Further, the machine even has its own distinct, synchronized and single point system for speed control. It also incorporates the latest system for detecting the label length. Hence the users no longer have to manually feed and store the information about the label length in the memory, and also retrieve the same every time in order to change the label size and restart the equipment. This automated and cost effective top & bottom labelling system thereby helps to save your valuable time, avoids down time of the machine, and enables to increase the output. Moreover it can precisely, repeatedly and swiftly label a wide range of flat packages. The equipment also has easily reachable hand wheel adjustments and side rail adjustments that help to increase the machine’s up-time. Besides this, it includes the most modern Netcom control technology, for providing a single touch, bright digital display screen for rapid set-up. This top and bottom labeling machine is capable of delivering an output of up to 60 labels in one minute, depending on the label and product size. The label roll has a diameter of 300 to 400 mm, and core diameter of approximately 75 mm. 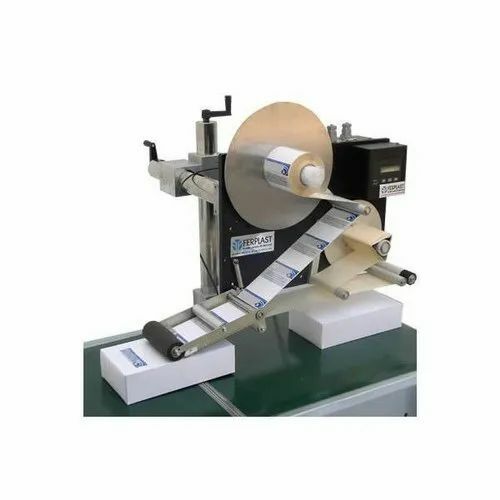 Further, the machine is also appropriate for online inkjet and contact coding system; and even for partial, full wrap around and overlap labeling. It does not require changing of parts when label size is changed. We are glad to introduce ourselves as manufacturers of Self Adhesive labels Rolls . We combine our past experience of 20 years in Pre-Press with professional team of labeling and labels experts to fulfill any labeling requirement. Our labeling solutions are at par with the best in the world with High Speed "NILPETER" (USA) servo flexo combination printing machine , capable of printing with UV as well as Water Based Inks. We offer high quality world class labels in all types of substrate such as Paper, PP, PE, clear on clear with eight colors printing and value additions to your label such as Inline coating/Varnish, Emboss effect, Perforation, Cold / Hot foiling, Lamination, Reverse printing and many more. The Sticker Labeling Machine has its own unique single point synchronised speed control system. The Inbuilt Automated Label Length detection systems eliminates any need for manually feeding and storing of Label Length data in memory and retrieving the same every time for change of Label Size & re-starting the machine. The System thus saves valuable time, avoiding machine-down time, and helps achieve higher production. 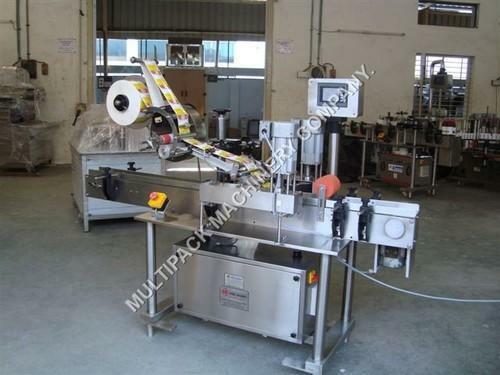 Looking for “Sticker Labelling Machine”?